Portraying long-distance relationships on-screen can be a tricky business but when they are told well, they can pack an emotional punch. With that being said, the first full-length feature from Catalan director Carlos Marques-Marcet delves into the complicated side of long-distance relationships, showing that love doesn’t necessarily conquer all. 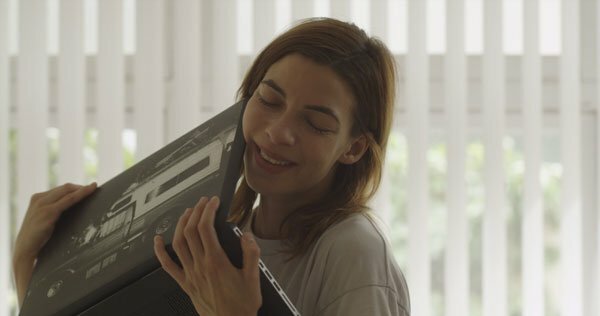 10,000km follows the relationship of photographer Alex (Natalia Tena) and music teacher Sergi (David Verdaguer), who are thinking of starting a family. When Alex receives a residency offer in Los Angeles, Sergi decides to stay in Barcelona due to his teaching commitments. As the two continue their relationship through Skype and emails, they begin to struggle without each other. Marques-Marcet tells a very balanced story, as each person has a chance to show their respective struggle. Alex doesn’t start to enjoy herself in Los Angeles until Sergi says so but in turn, he finds it hard while she fails to engage with him. The simultaneous narrative maintains the pace of a relative one-dimensional plot, but allows the frustrations between the couple to become increasingly evident, not only on an emotional but physical level. The use of social media, emails and Skype makes the story more modern and relatable, bringing instantaneous reactions from both characters. Both Verdaguer and Tena play the roles brilliantly, the two share great chemistry and the script is effective and to-the-point, complementing Marques-Marcet’s simple yet stunning direction. 10,000km is an honest love story, beautifully shot and sensitive performances from the two leads.